Japan Technology team member Kohei Nishimura shows us their newest monometal release, the Mirage. Designed specifically with 3A and 5A in mind, their translated announcement copy reads “Please feel the design skills of JAPAN TECHNOLOGY” which is pretty baller and we like it. Yoyo used is the Japan Technology Mirage. Japan Technology has a new yoyo coming out, and Kohei Nishimura knows what to do with it. Beautiful work. Japan Technology has a new yoyo coming out, and Kohei Nishimura knows what to do with it. Beautiful work. Check out their comments and specs below. FROST featuring a sense of stability and strong turning power. ARROWS which fused both designs is a monometal model that does not feel stress. The material is a very hard duralumin (first name undisclosed) which is adopted for the first time. Artwork creates overwhelming presence. It is a model full of Japanese manufacturing technology, commitment to products, feelings to products. I believe that “ARROWS” released from a Japanese town factory will reach the hearts of players all over the world. Bryan Figueroa is known for his 4A, but mostly that's just because people don't realize what a gifted 1A player he is. He's got it all...style, creativity, and some of the smoothest trick delivery you've ever seen. Yoyo used is the Japan Technology Origin. Bryan Figueroa is known for his 4A, but mostly that’s just because people don’t realize what a gifted 1A player he is. He’s got it all…style, creativity, and some of the smoothest trick delivery you’ve ever seen. Yoyo used is the Japan Technology Origin. Japan Technology's newest offstring yoyo, the Gull Wing, looks like a real masterpiece of a design and they're promoting it with one of the most beautiful and delicate offstring videos we've ever seen. I'm terrible at offstring, and this video makes me want to get up and work on it right. now. Japan Technology’s newest offstring yoyo, the Gull Wing, looks like a real masterpiece of a design and they’re promoting it with one of the most beautiful and delicate offstring videos we’ve ever seen. I’m terrible at offstring, and this video makes me want to get up and work on it right. now. Looks like Japan Technology has another titanium yoyo coming soon! Check out this teaser video…doesn’t really give us much detail, but it’s got some great tricks. Sweet! Japan Technology dropped a new promo video for their first titanium release, the Ribira. Japan Technology has a reputation for creating some of the highest quality and best performing yoyos in the world, so it's no surprise that their team would be able to slam out such good looking tricks with this one. Featuring Kentaro Mannen, Koyo Hashimoto, and Kohei Nishimura. Yoyo used is the Japan Technology Ribira. Japan Technology dropped a new promo video for their first titanium release, the Ribira. Japan Technology has a reputation for creating some of the highest quality and best performing yoyos in the world, so it’s no surprise that their team would be able to slam out such good looking tricks with this one. Featuring Kentaro Mannen, Koyo Hashimoto, and Kohei Nishimura. Yoyo used is the Japan Technology Ribira. Check out the Japan Technology AIRE (featured here) in action! This new signature model for long-time 4A pioneer and 6x National 4A champion Bryan Figueroa is a premium offstring yoyo from one of the most respected makers of offstring yoyos in the world. So, of course, the promo video was produced by Sector Y and is amazing. Yoyo used is the Japan Technology AIRE. Check out the Japan Technology AIRE (featured here) in action! This new signature model for long-time 4A pioneer and 6x National 4A champion Bryan Figueroa is a premium offstring yoyo from one of the most respected makers of offstring yoyos in the world. So, of course, the promo video was produced by Sector Y and is amazing. Yoyo used is the Japan Technology AIRE. Yuki Uchida gives up some truly inspiring 4A in his new video for Japan Technology. As a division, 4A seems to be on the rise at most major contests yet we still don’t see many videos that feature it…what gives? Get us those videos, people! High five to Yuki for this one though…killer stuff. Yoyo used is the Japan Technology Eagle Eye. Aoi Ogura lays down a few minutes of wonderfully intricate tricks in this new promo video for the Japan Technology Shaqshine yoyo. Japan Technology has a whole slew of new products coming soon, which means we can hopefully expect a lot of great new videos like this one. 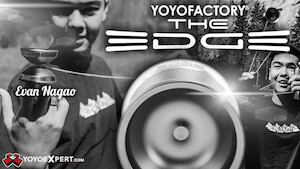 Yoyo used is the Japan Technology Shaqshine. Right, so Japan Technology went from being an offstring-only yoyo company with one token 1A yoyo that was basically only produced for the benefit of their team members, to dropping a whole line up of contest-killer 1A yoyos right before 2016 Japan Nationals. The Shaqshine is the latest announced release from Japan Technology, following the POM Wolty, Adel, and Ribira. But while the other models are complete and will be released at Japan Nationals, it looks like the Shaqshine isn’t quite ready just yet. Apparently the design they want to use has picked up some unavoidable vibe based on the design. They’ve figured out a different profile that eliminates the vibe (which is pretty minimal to begin with), but they don’t think the revised shape is a true representation of Japan Technology’s design aesthetic. You can read the full commentary from Japan Technology below, and even vote for what you think they should do. So check out the specs, and then scroll down for a statement from Japan Technology and a poll where you can vote on how they should release the Shaqshine! What JAPAN TECHNOLOGY pursued in SHAQSHINE was “JAPAN TECHNOLOGY-style”. When you touch SHAQSHINE while spinning, you can feel its vibration. You cannot see the vibration and there are no problems when using it, but it may be typically considered as Grade B. It can actually be fixed just by slightly changing the shape. We have already established the shape. However, if we fix the shape, there will be no meaning in releasing the new bimetal Yo-Yo from JAPAN TECHNOLOGY because it will be just like other bimetal Yo-Yos. The current shape and weight is the important part of this Yo-Yo. The factory suggested us to mass-produce models without vibration. We understand that. However, JAPAN TECHNOLOGY asked to produce the model as it is because we are truly confident in SHAQSHINE. We made SHAQSHINE with a stainless rim. Only 0.4mm of the base body will touch the stainless rim. We made it possible to keep the spinning force strong by making the stainless part thick. Please notice the rim’s width, form, and positioning as well. When all of those get together, it brings “JAPAN TECHNOLOGY-style” usability and operability. This is a message from JAPAN TECHNOLOGY to all of you. Which do you want JAPAN TECHNOLOGY to do? JAPAN TECHNOLOGY should produce real “JAPAN TECHNOLOGY-style” bimetal Yo-Yos. Or any bimetal Yo-Yos with a stainless rim from JAPAN TECHNOLOGY are ok. If you choose the second one, we will stop developing bimetal models. If you demand ” JAPAN TECHNOLOGY-style”, we will keep trying to do what only JAPAN TECHNOLOGY can do. We made a decision to sell “the best bimetal model” that JAPAN TECHNOLOGY can currently make, but it’s limited in quantity. We will have samples ready at the JAPAN TECHNOLOGY booth at the Japan National Yo-Yo Contest. Please try them and tell us what you think. Based on the suggestions, we will recreate “JAPAN TECHNOLOGY-style” bimetal Yo-Yos with both high performance ability and accuracy. We will officially release “SHAQSHINE” when it is completed. Thank you for your understanding and support. ※SHAQSHINE is the black one in the picture. It is the silver model without the vibration. Atsushi Yamada’s company, Japan Technology, is really on a roll right now with announcing new releases. 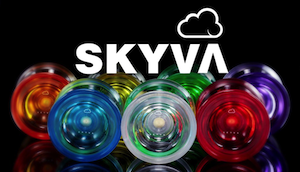 A new budget offstring yoyo, a new 1A model, and now…a new titanium yoyo that manages to avoid a “Ti” pun in its name? Highest of fives, Atsushi. The Ribira looks to be pretty much the same profile as their new 1A release, the Adel, but with changes made to wall thickness and weight distribution to specifically take advantage of the material. check out full specs and their press release below. JAPAN TECHNOLOGY proposes “The Real Titanium Yo-Yo”. It took about two years to create “RIBIRA”. It raises the possibility of Titanium Yo-Yos. Which Titanium out of a variety of choices is the best for Yo-Yos? What cutting method and equipment meet the ideal way to shave Titanium to make Yo-Yos? The design could only be created because of Titanium. A lot of technique was effectively used, and as a result, “RIBIRA” was born with both high quality and luxuriousness. Japan Technology has announced a new POM version of their introductory offstring model, the Wolty. Japan Technology has really made a name for themselves with some of the best offstring yoyos on the market, and this new version of the Wolty looks like it will be continuing that tradition. Japan Technology has announced a new 1A yoyo, the Adel! They’ve designed it to play light and fast, and coming from a legendary player like Atsushi Yamada I think it’s a safe bet this is going to be pretty damn good. Check out the promo video, full specs and photos below.